Flow cytometric analysis of COS-7 cells using DNMT1 (D63A6) XP® Rabbit mAb (PE Conjugate) (solid line) compared to concentration-matched Rabbit (DA1E) mAb IgG XP® Isotype Control (PE Conjugate) #5742 (dashed line). 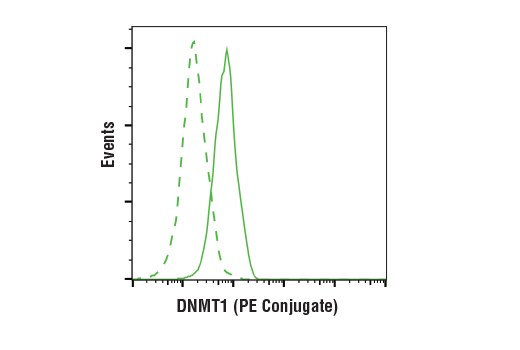 DNMT1 (D63A6) XP® Rabbit mAb (PE Conjugate) detects endogenous levels of total DNMT1 protein. Monoclonal antibody is produced by immunizing animals with a synthetic peptide corresponding to the sequence of human DNMT1 protein. This Cell Signaling Technology antibody is conjugated to phycoerythrin (PE) and tested in-house for direct flow cytometric analysis in human cells. This antibody is expected to exhibit the same species cross-reactivity as the unconjugated DNMT1 (D63A6) XP® Rabbit mAb #5032. Methylation of DNA at cytosine residues in mammalian cells is a heritable, epigenetic modification that is critical for proper regulation of gene expression, genomic imprinting and development (1,2). Three families of mammalian DNA methyltransferases have been identified: DNMT1, DNMT2 and DNMT3 (1,2). DNMT1 is constitutively expressed in proliferating cells and functions as a maintenance methyltransferase, transferring proper methylation patterns to newly synthesized DNA during replication. DNMT3A and DNMT3B are strongly expressed in embryonic stem cells with reduced expression in adult somatic tissues. DNMT3A and DNMT3B function as de novo methyltransferases that methylate previously unmethylated regions of DNA. DNMT2 is expressed at low levels in adult somatic tissues and its inactivation affects neither de novo nor maintenance DNA methylation. DNMT1, DNMT3A and DNMT3B together form a protein complex that interacts with histone deacetylases (HDAC1, HDAC2, Sin3A), transcriptional repressor proteins (RB, TAZ-1) and heterochromatin proteins (HP1, SUV39H1), to maintain proper levels of DNA methylation and facilitate gene silencing (3-8). Improper DNA methylation contributes to diseased states such as cancer (1,2). Hypermethylation of promoter CpG islands within tumor suppressor genes correlates with gene silencing and the development of cancer. In addition, hypomethylation of bulk genomic DNA correlates with and may contribute to the onset of cancer. DNMT1, DNMT3A and DNMT3B are over-expressed in many cancers, including acute and chronic myelogenous leukemias, in addition to colon, breast and stomach carcinomas (9-12). Kim, G.D. et al. (2002) EMBO J. 21, 4183-4195. Fuks, F. et al. (2001) EMBO J. 20, 2536-2544. Geiman, T.M. et al. (2004) Biochem. Biophys. Res. Commun. 318, 544-555. Rountree, M.R. et al. (2000) Nat. Genet. 25, 269-277. Pradhan, S. and Kim, G.D. (2002) EMBO J. 21, 779-788. Fuks, F. et al. (2003) Nucleic Acids Res. 31, 2305-2312. Mizuno, S. et al. (2001) Blood 97, 1172-1179. Robertson, K.D. et al. (1999) Nucleic Acids Res. 27, 2291-2298. Xie, S. et al. (1999) Gene 236, 87-95. Kanai, Y. et al. (2001) Int. J. Cancer 91, 205-212.